On Monday morning, news of a tragic accident on Whyte Avenue sent Edmonton’s cycling community into shock. Isaak Kornelsen, age 21, fell under the wheels of a fully loaded cement truck after losing control of his bike while trying to dodge a large mirror sticking out from a large pickup truck that was parked more than a foot away from the curb. 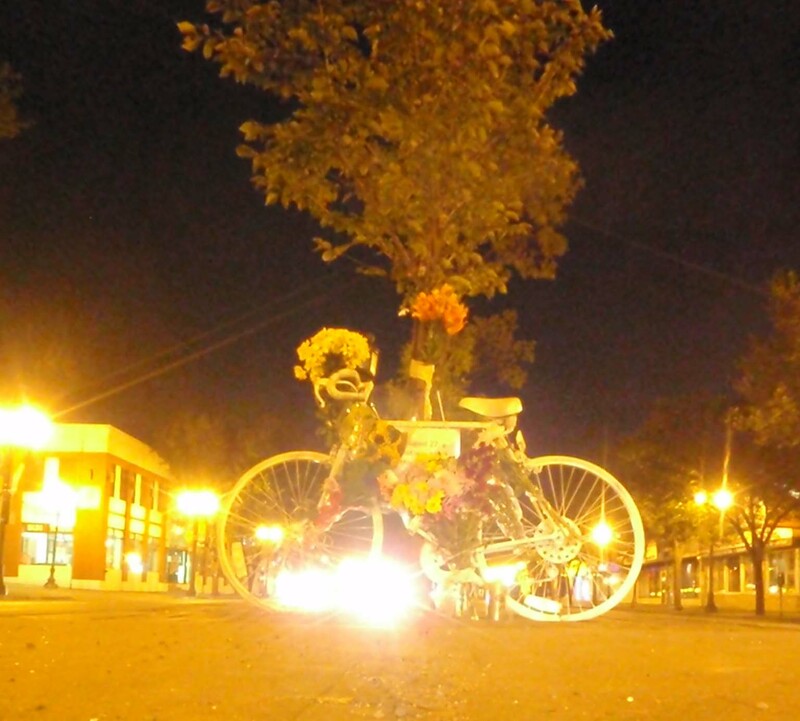 Ghost bike on Whyte Ave in memory of Isaak Kornelson. It didn’t take long for word to spread about what had happened and for glimpses of who this young man was to appear. At the University of Alberta, he was a track athlete and a student in philosophy. He worked at a local vegetarian restaurant. He rode a bright orange Masi. He had graduated valedictorian at a nearby high school. People who knew him spoke of respect and love for a talented, accomplished, but humble young man who was a true leader and inspiration. His family are also cyclists. He sounds like the kind of person that this world is sorely lacking, and I send my heartfelt condolences to his family, friends, and everyone else who is mourning his passing. Mourners gather and light candles at the ghost bike memorial. 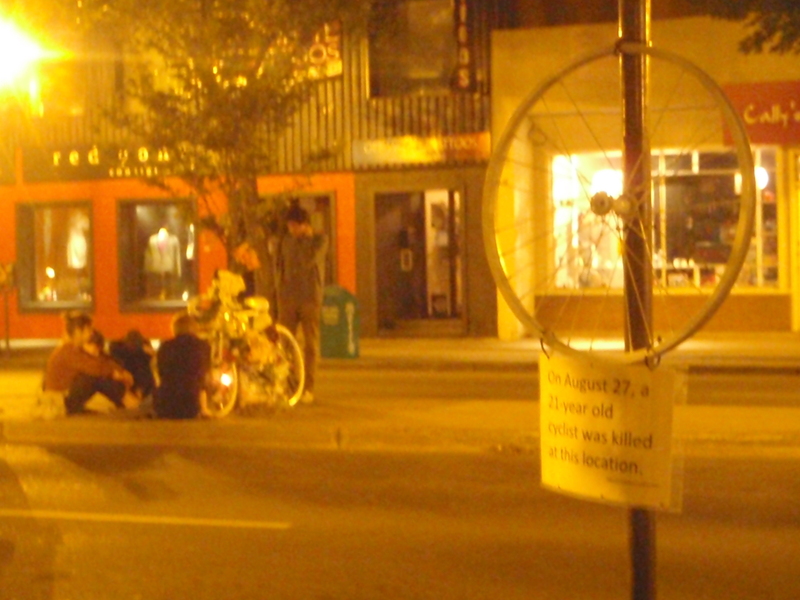 The accident happened only a couple of blocks from BikeWorks South, and there were many witnesses, including an EBC member, who went directly to BikeWorks and started working on a ghost bike with Chris, which was installed mere hours after the accident happened. The police called it a freak accident, but that implies that it wasn’t preventable. While I can only speculate about exactly what happened, I ride that stretch of road several times a week, and from all the witness descriptions, I feel like Councillor Ben Henderson’s summation that everybody involved, the cyclist, the pickup driver, and the cement truck driver, were pushing the limits of safety, limits that are routinely pushed every day on the Avenue. I want to be clear that I’m not blaming anyone involved, but as cyclists there is a lesson we can learn. That lesson, simply put given the current infrastructure, is take the lane. This accident has reignited calls for bike lanes on Whyte Ave, but along with lack of infrastructure, has also highlighted the lack of cyclist and driver education that allowed this to happen in the first place. On mainstream media sites (Global’s facebook page, I’m looking at you) I’ve wretched after reading some of the nasty, victim-blaming comments, and even more friendly voices have said things like “that’s why I always ride on the sidewalk” and “riding on Whyte Ave is suicide.” Well, until there’s proper bicycle infrastructure, I’m going to keep on riding on Whyte Ave, taking the lane. If drivers want to get annoyed & honk at me, I’ll be reassured, because I’ve got the right to be there, and because when they honk, it means they saw you. It’s still the fastest way to go, and believe it or not, is safer than the sidewalk where every intersection is another opportunity for a collision, or being squeezed in between a lane of traffic and a lane of parked cars. I know it sounds scary to a lot of people, and there is always the slower, less direct alternative of taking the side streets, but even if you don’t feel like you can assert yourself in a lane of traffic, or that you’re not ready, I hope that you’ll keep in mind that level of comfort as a goal. This Friday, the monthly Critical Mass ride will be dedicated to Isaak’s memory, at the request of some of his friends. As usual, meet at City Hall, by the fountain, at 5:30. Wear yellow in honour of Isaak. Together, we’ll take back the streets, if only fleetingly. I expect we’ll alter the usual route to include an emotional visit to the scene of the accident. Thank-you. I edited the post to include that.